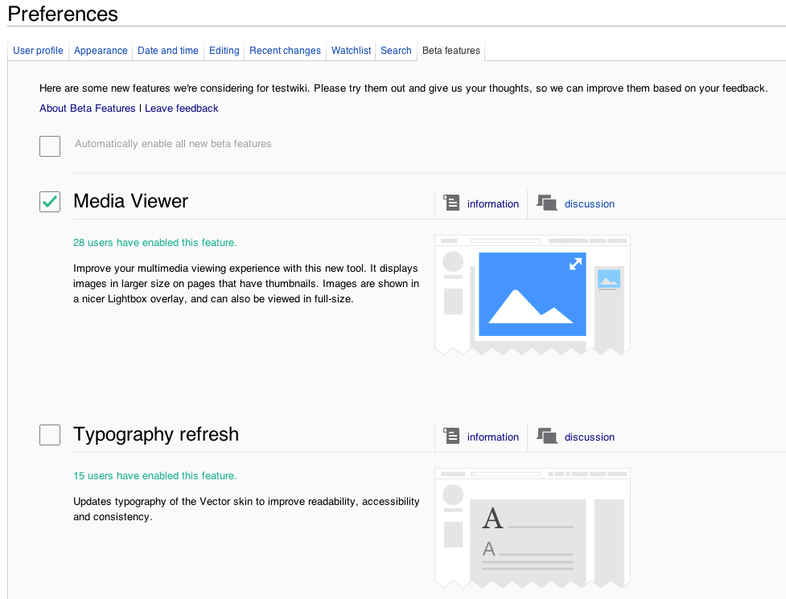 Wikimedia today announced the launch of a beta program simply called Beta Features. In short, the organization is offering a way for users to try out new features on Wikipedia and other Wikimedia sites before they are released for everyone. If you’re reading this with bated breath, you’ll be happy to know logged-in users can join the early testing right now on MediaWiki.org, meta.wikimedia.org and Wikimedia Commons. Wikimedia plans to release Beta Features on all wikis in two weeks, on November 21, although the date may shift depending on the feedback the organization receives. Media Viewer: Improve your multimedia viewing experience with this new tool. Media Viewer displays images in larger size on pages that have thumbnails. Images are shown in a nicer light box overlay, and can also be viewed in full size. VisualEditor: VisualEditor makes it easy to edit pages without having to learn wiki code. Beta Features includes an opt-in version of this tool on sites where it is available, but not yet enabled by default. Wikimedia is also adding new experimental features that enhance VisualEditor. VisualEditor formulae editing: With this opt-in feature, you can add support inside VisualEditor for creating and editing mathematical formulæ like algebra or equations on pages you’re working on. Typography Refresh: This beta feature makes text more readable, accessible and consistent. It updates the Vector skin to use serif fonts in section headings and sans-serif in the body copy, for a better visual experience. Scheduled for first release on November 14. To participate, head to your user preferences, navigate to the new Beta Features section (pictured above), and pick the items you want to test. You can also automatically enable all new beta features as they are released, if you like, and revert any options whenever you want. You can submit bug reports to Wikimedia on Bugzilla.